If you’re looking for a travel destination less explored (ugh, the mass tourism), you should consider the mythical Silk Road countries: 5 Stans (Kyrgyzstan, Uzbekistan, Kazakhstan, Tajikistan and Turkmenistan), along with Silk Road China. I hope this article will give you some inspiration and ideas for your dream Central Asia itinerary. So, without a further adieu, shall we? P.S. I’ve written a blog post on what to do in Kyrgyzstan, what to eat and how to get around, before, so do check it out to learn more about the country before you start planning your itinerary. Overnight at Karakol with a 2 day hike to Ala-Köl or in Jyrgalan area. You can also visit Jeti-Oguz Canyon for Seven Bulls Rocks. 2 days in Samarkand, one of the oldest continuously inhabited cities in Central Asia. Poets and historians of the past called it “Rome of the East, The beauty of sublunary countries, The pearl of the Eastern Muslim World”. Overnight in Khiva, an ancient trading center on the Silk Road and the capital of Khive Khanate. You’ll also visit Urgench as a stopover for Khiva. Towns in the Fergana Valley: Rishtan, known for its glazed ceramics, and Kokand. These are ideal stops if you’re traveling to/from Osh, Kyrgyzstan. Baikonur Cosmodrome: The site has mostly been used to launch Soviet Union and Russian cosmonauts, but after the Cold War cooled, American and European astronauts started to launch there as well. The cosmodrome is still in use today so you might spot the actual launches, if lucky! Aral Sea: the lake that disappeared. Today you can see the dry landscape that reminds of a ship graveyard. One of the two lesser known siblings of the Stan family where over 90% of the country are mountainous. It’s the easiest to visit the country if you’re coming from Kyrgyzstan and heading to Uzbekistan next. 2 days in Dushanbe, the capital. Visit the Museum of National Antiquities, Haji Yakoub Mosque & Madressa and Hissor Fort. Iskanderkul, a must-see alpine lake. Did you know that the name of Iskanderkul Lake means the Lake of Alexander the Great? There are many legends about the lake and Alexander the Great. Darvaza gas crater (also known as ‘Door to hell’), located in the middle of Karakum desert, with a stop in Erbent village on the way from Ashgabat. Did you know that this fire has been burning since 1971? It’s a truly spooky sight at night. The fastest way to sample Central Asia is to visit just 2 countries: Kyrgyzstan and Uzbekistan. These countries are a great example of the diverse and colorful landscape found in the region. Your express itinerary should keep you busy for 10-14 days. See the Kyrgyzstan and Uzbekistan sections above for more details on the destinations. The main task for you will be ensuring smooth transfers between the countries. 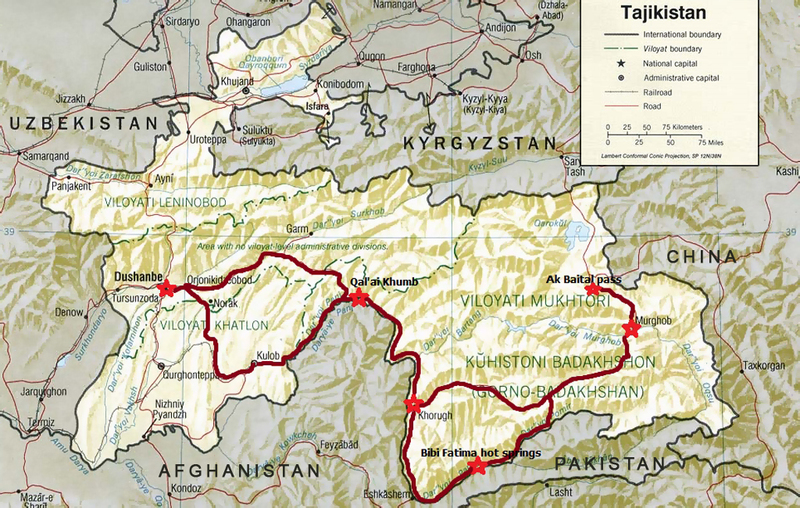 From there, continue to Kyrgyzstan via Torugart to Naryn or Irkeshtam Pass to Sary Tash. Plan for a month long journey. Alternatively, start at Urumqi that “was a major hub on the Silk Road during China’s Tang dynasty, and developed its reputation as a leading cultural and commercial center during the Qing dynasty in the 19th Century” (Wikipedia). Take a few days to explore this buzzing city! If you have time to venture outside of the city, visit Heavenly lake of Tianshan and Bogda Peak. Then transfer to Almaty, Kazakhstan. What’s your dream Central Asia itinerary? Or have you traveled to Central Asia before? Share your experiences with us!